Learn the art of designing, sculpting, mold making, silicone casting, airbrushing! Sign up for a 10-day Silicone mask making workshop with SFX Makeup Artist Petra Shara Stoor at Helsinglight SFX Makeup Academy, Sweden. Learn the art of designing, sculpting, mold making, silicone casting, airbrushing! Book your spot now! Next FX Silicone Mask Making workshop May 2-12th! Register and secure your place with a deposit of €350 / SEK 3500. When you book your spot you’ll get an email with an invoice for the deposit to be paid within 20 days to secure your booking. The rest of the balance to be paid prior to the workshop starts. Work with Chavant plasteline, WED-clay, marble stone plaster, EcoFlex silicones, Psycho Paint silicone colors, Iwata airbrush. Professional photo shoot of your character in a creative environment with costume, FX-lenses, props etc. Learn the art of concept & character design, inspiration and mood boards, sketching. Learn sculpting techniques and how to work with plastelina clay vs WED-clay. Sculpt your design/mask in clay (full mask). Learn how to divide your design in 2 by finding the case line. Learn the art of building a dry wall and and clay wall, keys, pry-marks and how to create a 2-piece solid marble stone mold. Opening of molds, clean and prepare your mold for silicone casting. At this stage you will prepare your mold for silicone casting. You will learn the art of working with silicone, mixing and measuring silicone, choosing base color for your silicone. You will learn the brush-on techniques of silicone into your mold. When the silicone has fully cured it is time to open the old and pull out your silicone mask, clean it, patch it and prepare it for airbrushing. You will how to airbrush your mask with silicone colors as well as handpainting. The final day is a photo shoot of your character with a professional photographer. During the photo shoot you can use fx-lenses, costumes, props etc for a more realistic final look and feel. This "old man" silicone mask was created by our student Markus Lööf on our last 10-day silicone mask making workshop. Markus works mainly as a carpenter and has never sculpted anything before. Very impressive work for a first time mask maker! English: The course is mainly held in Swedish and English as the main language, but we can also assist in Finnish if any course participant is in need of it. Svenska: Kursen hålls främst på svenska och engelska som huvudspråk, men vi kan även assistera på finska om någon kursdeltagare är i behov av det. Suomi: Kurssi järjestetään pääasiassa ruotsiksi ja englanniksi, mutta pystymme auttamaan myös suomenkielisiä kurssille osallistujia suomeksi. Beginner to Advanced. No prior experience in mask making needed. *Deposit of € 350 (SEK 3500) is part of the course fee and the rest of the balance is to be paid prior to the start of workshop. Price includes all materials and tools needed during workshop. We only work with high quality materials used by professionals in the SFX/Hollywood industry. The deposits are non refundable due to orders of material and preparation costs for the workshop. The remaining balance can be refunded up to 30 days before the workshop takes place. If cancellation occurs any later the funds can be transfered into taking part in another workshop at another occasion at Helsinglight FX. We can set up a plan where you pay the course fee in three monthly instalments. Contact us for this option. We are happy to help you out with tips on travelling here and accommodation during your stay! Day 1 - Thursday: Intro, design, sketching and adding base of clay to your sculpture. Day 2 - Friday: Sculpting - rough design. Day 7 - Wednesday: DAY OFF! Day 8 - Thursday: De-molding, cleaning mold and preparing for silicone casting. Day 9 - Friday: Silicone Casting - measuring, mixing and colouring silicone, brush on into mold. De-molding, cleaning up silicone mask, seaming and patchwork. Preparing mask for airbrush. Day 10 - Saturday: Airbrushing your silicone mask using silicone colors! Day 11 - Sunday: Professional photoshoot of your final design and character. This workshop is an opportunity not to be missed whether you are a professional already working in the industry and wanting to learn more, or whether you're just starting out and looking for a stepping stone into a new career within SFX-makeup, mask making and props. You will learn from experienced SFX-artist in the industry and work with high quality materials used by top SFX-artist in the world. You will network and connect with likeminded people and artists in the industry. This is a workshop that will ignite your creative spark. This intense and creative 10 day silicone mask making workshop is an opportunity for you to build your portfolio and knowledge in many areas. You will sharpen your design and sculpting abilities, you will get a very good understanding of how mold making works and how to work with silicone as a material. During the workshop there is both theory and hands on practical days. 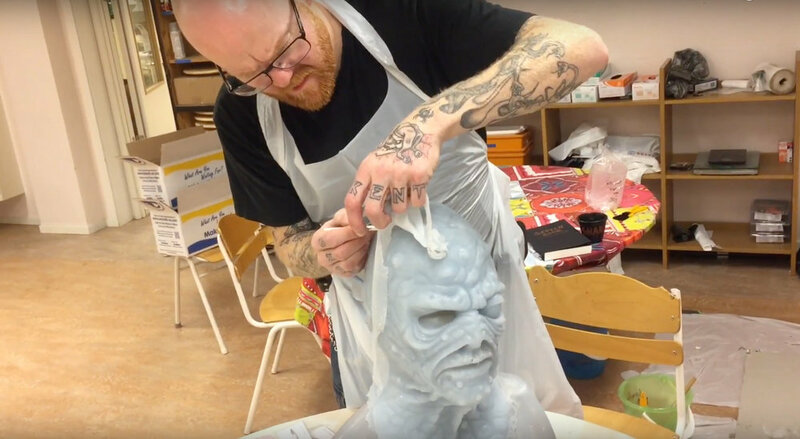 This workshop will help you understand the different stages and processes involved in SFX Mask making, all from designing, sculpting, mold making, silicone casting, airbrushing to a finished piece of artwork. When you have finished the workshop we offer you the opportunity to purchase your own sculpting bust, sculpting tools, clay etc so that you can continue practicing your skills at home. We also sell plaster, silicone etc if you wish to purchase that. This workshop is filled with technical and practical knowledge and a unique experience of a life time to be part of. You will be richer in knowledge, experience and find new friends for a lifetime! This workshop is located in the beautiful countryside in Jättendal, in the mid north Sweden! It is very easy to travel here, we're located only 2,5 hours north of Stockholm Arlanda Airport. Travel by train or bus to Hudiksvall city, we will pick you up from there and drive 30 min to the workshop location. We can also help you out with advice on accommodation during the workshop. The workshop is held in multiple languages both Swedish and English. No prior knowledge in mask making is required, but it is always good and beneficial if you've got an interest or some experience in arts or SFX-makeup. But even if you are a beginner, a great passion for SFX-makeup and arts will take you a long way. This could possible be a stepping stone into a new choice of career. Class sizes are kept to a minimum to meet everyones specific needs during the workshop. We're encouraging teamwork in the class and to help your friend out if assistance is needed. With the classes being so small you will get to know everyone in the workshop, kinda like a new SFX-family! Friends for a lifetime! The workshop price includes tuition, high quality materials and tools needed during the workshop. We also supply "Swedish Fika" during the workshop hours, ie.free coffee, tea, fruits, chocolate etc. € 500 deposit to be paid when you book your place. The deposit is part of the course fee and secures your place at the workshop. The remaining balance to be paid 1 week prior to the 1st day of class. Please note all deposits are non-refundable due to costs and payments on orders and preparation for the workshop. Payment plans available. We recommend that you bring your own sculpting tools and art brushes if you have some, if not you can borrow from us or buy a kit of your own. During the workshop we offer various products and tools for sale, ie. basic sculpting tool-kit, airbrush-kit, acrylic eyes, sfx-lenses, clay, sculpting bust, etc. Payment plans available If you need financial support. Contact us for more information! If you need advice on travel and accommodation options to attend our workshops then have a look at our accommodation and Travel guide. During this intense and creative 10-day silicone mask making workshop you will learn many techniques in the art of mask making! First of all you need to start looking for inspiration to your design and mask by sketching or creating a mood board say in pinterest. Some students will change their mind over and over before they decide wha design to go with, others know right away what kind of look they want to aim for. During this process we will also go through the process of silicone as a material and what to think about when designing your makeup. The best is to always look for multiple sources of inspiration, decide certain features for the look and some color scheme. Nothing is set in stone until the sculpture is finished and ready for molding. This art form has been around for thousands of years but is just as relevant today. During our workshop you will learn from scratch how to make a clay sculpture and realize a three-dimensional piece of your makeup modeled in plastelina clay. You will learn about blocking forms and avoiding undercuts. You will learn how to work with different tools and how to create textures and fine details with different techniques! Clay is also a very forgiving art form and process, where you can change and correct the parts and details that don't look right. Mold making is also a piece of artwork and craftsmanship which is not to be underestimated!A good mold maker is someone who will be remembered too! You will learn how to find the case line (where to divide your sculpture), how to avoid undercuts, how to make a good solid 2-piece mold with keys and pry-marks. How to create a mold that will capture every fine detail of your sculpture. This is a very exciting part of the process, the part when it is time to de-mold and see the negative that has captured all the details of your clay sculpture. You will learn how to clean and prepare your mold for silicone casting! This is the stage where you will need to visualise your creature design and choose a base color for your silicone. You will learn the art of mixing, measuring and calculating amounts of silicone needed for your mask and what pot life and working times mean. You will learn how to brush the silicone into the mold avoiding air bubbles and thin patches. When the silicone has cured you will de-mold and see your mask for the first time! You will learn seaming and patchwork and how to prepare your mask for airbrushing! The final stage of the workshop, the airbrushing and colouring of your mask! This is where you work on the final details of your vision, using an airbrush to highlight your piece with silicone colors to make it come alive! The 10-day workshop finishes with a professional photo shoot of your character in a location that suits the design and feel of what you have created. You will apply the mask to yourself or a model, add makeup, FX-lenses, costume, props etc, all to create a final look of your silicone mask artwork and to get photos for your portfolio. 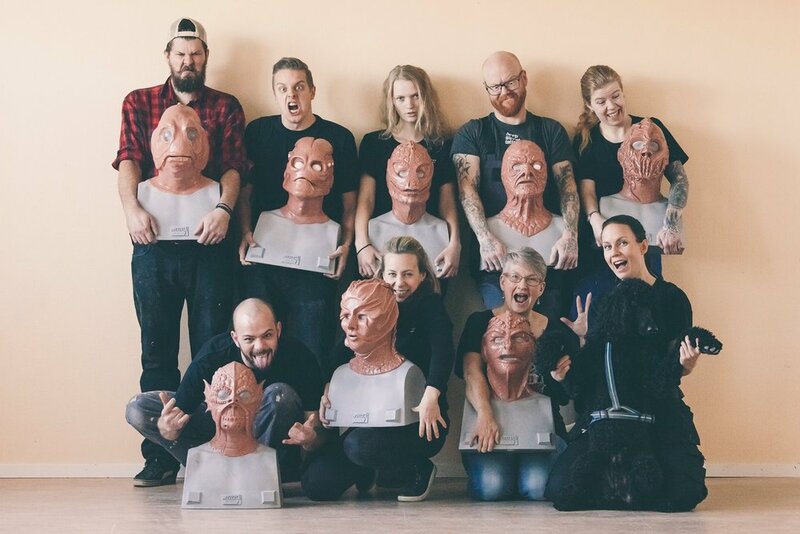 10-day Silicone mask making workshop with SFX Makeup Artist Petra Shara Stoor at Helsinglight SFX Makeup Academy, Sweden. Learn the art of designing, sculpting, mold making, silicone casting, airbrushing! 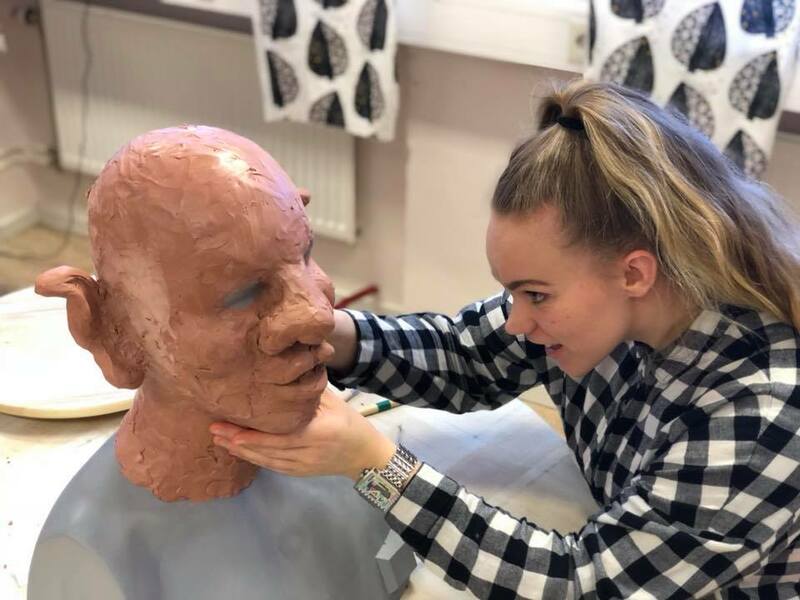 Fill in the form to register your interest for a 10-day Silicone mask making workshop at Helsinglight FX Academy in Hälsingland, Sweden.